Well, today is the last day of 2011. I hope it has been a blessed year for you. God has been with us through some really great times this year and through some difficult ones as well, but in the end God is Good all the time! We have been blessed and are thankful. I thought I'd share a favorite recipe of the holiday season with you today. We love these Graham Cracker Pecan cookies. I only make them at Christmas because the are very rich. Pecans just scream Christmas to me!! OK here is the recipe: 1 1/2 pkg of graham crackers, 1 stick of butter and 1 stick of margarine, 1/2 cup sugar, 1 to 1 1/2 cups chopped pecans. 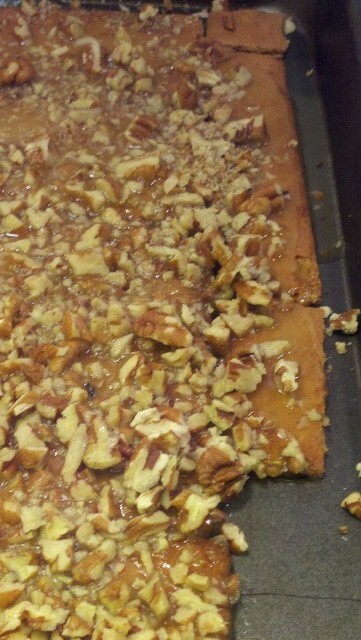 Layer the graham crackers on a jelly roll pan. In a sauce pan add the butter and sugar and bring to a good boil. Boil for 5 minutes or until golden brown. 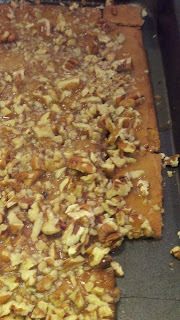 Pour over graham crackers and spread evenly, Sprinkle pecan pieces on top. Bake at 300 degrees for 10 minutes. Break apart and cool on wire rack. So easy and so good!!!! Enjoy. I wish you all a very Blessed New Year. Like it's some big surprise, December 25th comes around every year and I'm never even close to ready. Of course when you do the most of your shopping on the 22nd should you really be surprised? I love to make cards of course, bake, attend Christmas events at church and in the community, but I have realized I love to do all these things with company! It is most meaningful to me to stamp with my stamping sisters and bake with friends or family members. So thank you to those who took the time to give me your gift of friendship and time. It was most appreciated! I have a couple Christmas ideas I want to show yall. 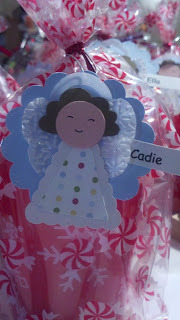 I made these little tags for the goody bags for Cadie's preschool class. They turned out really cute IMHO! 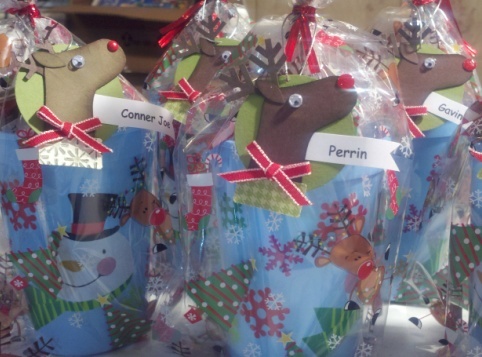 The reindeer are made with the stocking punch #124095 and the antlers are one of the snowflake sizzlets. Most of the noses were just punch with a hole punch and covered with Crystal Effects. The angels for the girls were made with the Pennant punch, the Butterfly punch and 3/4 circle punch. 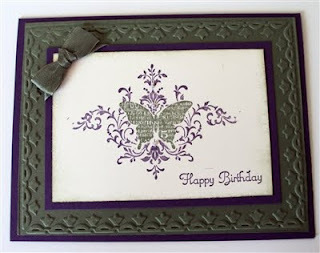 The butterfly angel wings were run through the Big Shot with the Elegant Lines embossing folder for texture. These were really fun to make. I layered them on a scalloped circle so they could be hung on the tree as an ornament. Well, that's it for today. I am wishing yall a great Christmas season and don't forget the Reason for the Season. Be a blessing and you will be blessed. 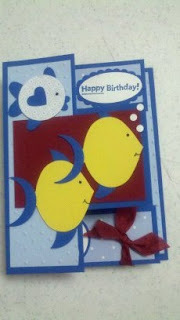 Not a great picture, but a cute card. I made this card for a stamp a stack of simple cards. 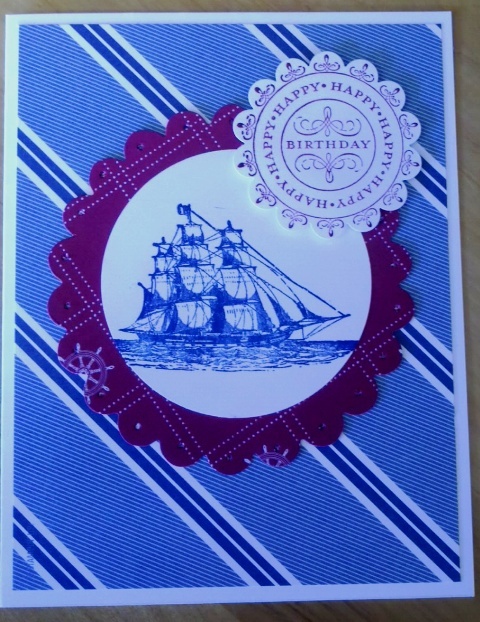 The card stock is Night of Navy and Whisper White. The Whisper White piece is run through the Big shot with the Polka dot textured plate. The stocking is stamped with Night of Navy ink using a stamp from the Stitched Stockings stamp set in the Holiday mini and punched out with the stocking punch. Can you see the 2 mini jingle bells tied on the corner with Cherry Cobbler and white bakers twine( love this stuff)? There is a rhinestone jewel in the center for some added bling. What are your thoughts on this one? Leave me a comment and let me know. Thanks for looking, gotta go. Be Blessed today and Bless those around you! I know Red and Green are traditionally Christmas colors, however I love Blue. It has been one of my favorite colors for years, All shades from Navy to Baby! 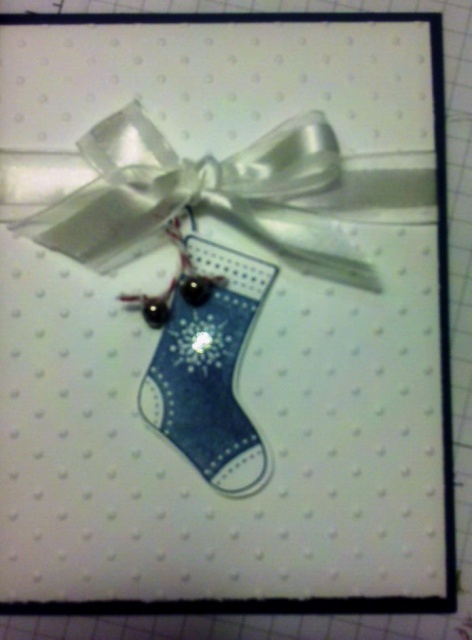 Almost very year I make my Christmas Cards in blue. I haven't decided for sure this year ,but I have a couple of samples that might just be this years card. 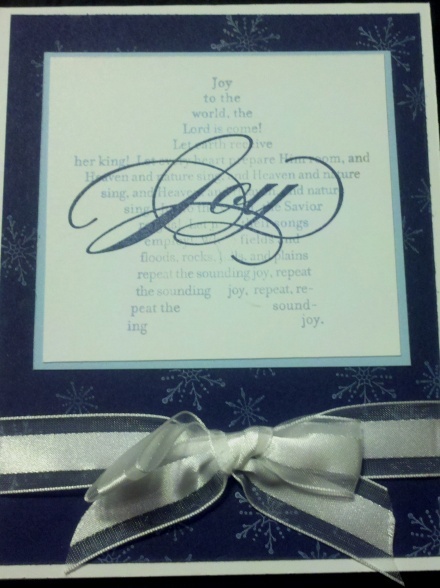 The card uses the Sounding Joy stamp set from the Holiday Mini. LOve LOVe LOVE this stamp set. I like to do cards that reflect the true meaning of Christmas for Tombo and I. "For God so love the whole world, He sent His only Begotten son..."This is a real reason to celebrate! So give me your vote, should this be this years card? Cardstock is Night of Navy, Bashful Blue, and Whispher White. Ink is Bashful Blue and Night of Navy also. I'll show you another one next time, if you love this card and want to make them, shoot me an email and I'll help you get started, but hurry there are only 15 days left til Christmas 2011. Of course you could get a head start on Christmas 2012 them you have 380 days! Blessings to each of you! Good morning. This is not a stamping post today. My other love is cooking. I have loved to cook since I was very young. I even entered the Autauga County Fair with I was 13 or 14 and won first place for a sour creme surprise pound cake! I also won prizes for my biscuits and cornbread muffins. Of course, this is not a big surprise as my Nana and mother were both excellent cooks and bakers. My mother still is, but Nana is probably cooking up a storm in heaven. Well, recently I need to make something with left over Turkey. I am a big Pampered Chef fan and used to sell Pampered Chef cooking tools, so I thought of the Turkey Cranberry ring that was very popular several years ago. Unfortunately I didn't have most of the ingredients. I did have turkey, mayo, celery, and cranberries. One of the most importa nt ingredients in a ring is the crescent rolls, didn't have these. What to do?Well, I had biscuits- an idea is brewing. Criss-cross apple crowns use biscuits!!! So I substitute biscuits for the crescent rolls, then I substituted Parmesan cheese for Swiss, pecans for walnuts and honey mustard for Dijon!! 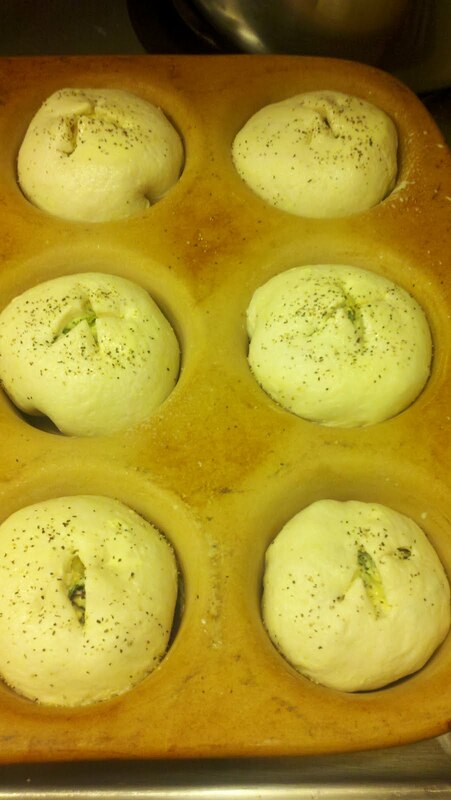 I rolled out the biscuits and put a large scoop of turkey mixture in the center and pinched the bottom together placing them in a stone muffin pan. I have to say, it worked great and they came out delicious. We had individual turkey cranberry stuffed bundles! They were great that night for dinner and the next day for lunch! Sometimes thinking outside the box can be a good thing. Substitution can produce a great new recipe, however, I don't suggest using frosted flakes in place of corn flakes on top of a hash brown casserole-that's a story for another day! Have a very blessed day and bless some one else today. Lots of projects, no time!! Well, it's 18 days til Christmas, are you ready? For those of you who know me, I'm months behind!!!! I still have Halloween projects I wanted to share! And we won't even talk about how many Christmas cards I still need to make. We attended our first Christmas party of the season Sunday at the home of Mike and Diane, sweet friends from our Sunday School Class. It was a blast. We played Dirty Santa. 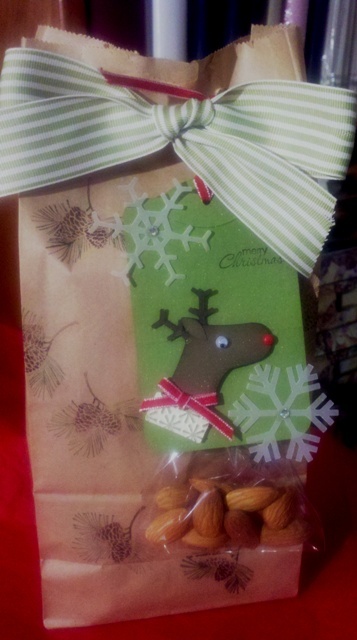 Here is a picture of the lunch bag I stamped to conceal the silly reindeer tie Tommy took for his gift. It's a regular ole lunch bag, stamped with a pine branch and tied with Old Olive 1 1/4 inch striped ribbon. The reindeer tag is made with the Big Shot two tags die,the stitched stocking punch and one of the snowflake sizzlets. I love making different projects from punches. Of course I did not come up with the idea, but I'm great at copying!!! !There is a small bag of nuts attached to the bottom of this tag with a reindeer droppings poem on the back. 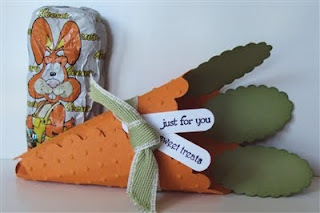 Just an example of a quick and easy way to wrap up a gift that's really quite adorable! Need to get back to the worktable. Have a really blessed day and go be a blessing to someone else. Much love. 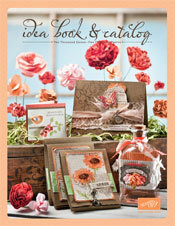 I'm loving the new Idea Book and Catalog from Stampin' Up! It is the prettiest cattie we have ever had in my opinion. If you haven't gotten your copy yet let me know. Cost is 10.00, however with a 50.00 order before July 31st It's free!!!!! Free is good. This cattie is full of great crafting ideas. Drop me an email and I'll get one to you. Also, we have a brand new hostess program that is really great. Host a workshop and get free product of your choice. You can even earn a half price item!! Gotta run. Be blessed and be a blessing! He is Risen! He has Risen indeed! Good Morning Good Friday! I'm on a roll! It's been a busy week, but God is good all the time and all the time God is good. That is a quote from a dear friend Ruth Stauffer, who lost her battle with cancer last yr. but is rejoicing in Heaven with her Risen Savior! I have an Easter card to share today using the stamp set a Flower for all Seasons. This is a cute little set that is very versatile. The DSP is from the Vintage Springtime collection in the Occasions mini. Just a sweet card, IMHO! Well, that's it for today. Hope you have a really great day. And remember go bless someone else and you will be truly blessed. Good Morning Stamper Friends. I hope yall are having a great week. 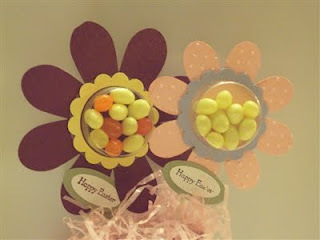 As I promised, I have another Easter Candy treat project to share with yall today. 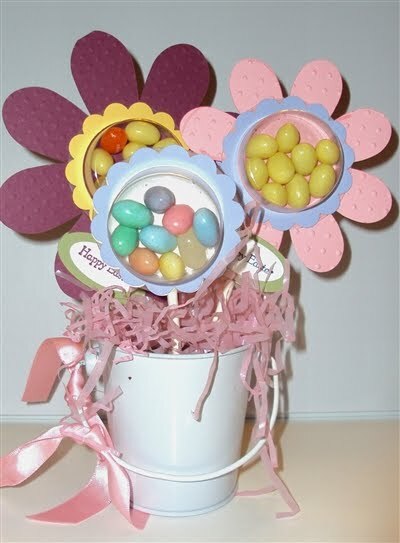 This could easily be used for any spring event like Mother's Day, a ladies tea, or as decorations for the end of the year events at school or church. Isn't this cute? 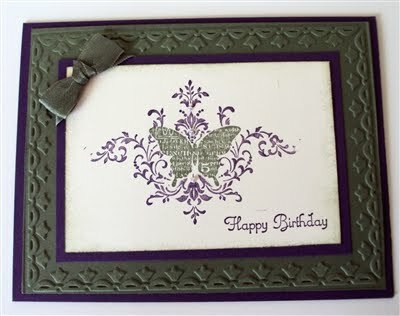 The 2 large flowers where cut with the Flower Folds Big Shot die and the smaller one in front is made with the extra large scallop circle punch. I also used that punch with the large circle punch to make the scallop around the center treat cup. 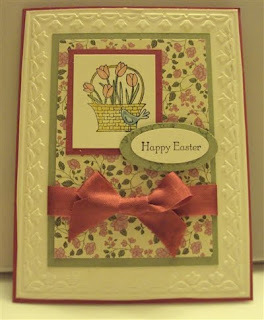 I stamped Happy Easter on Whisper White CS, then layered that on Pear Pizazz to resemble a leaf. 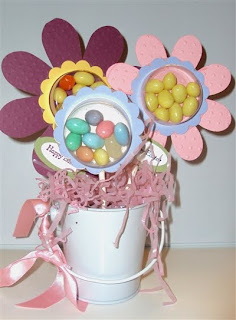 The little pails came from a discount store, I just stuck in a little Styrofoam and Easter grass (I hate that stuff, gets everywhere) Howev er, makes a really cute table favor or small centerpiece. Hope this is useful for yall. If you have any questions, shoot me a comment and I'll be happy to help. Have a great day. Be a blessing and you will be blessed. Easter is one of my favorite holidays. Like Christmas the True meaning gets lost in the bunnies and dyed eggs at times, but it's just a lot of fun. 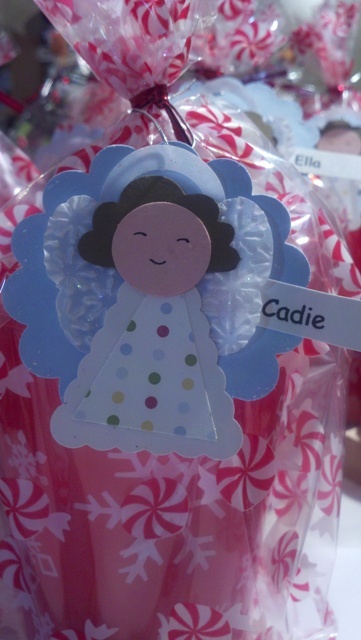 Cadie has been hiding Easter eggs for a good week now. I have a couple of Easter treats to share with you, but you only get one today, so keep coming back so you don't miss the next one. This cute little carrot is so simple! I simply cut the large scalloped circle using the big shot and ran it through the polka dot embossing folder, then rolled it into a cone. Next, I added the three Pear Pizazz "leaves" cut out with the scalloped oval punch. I did dust them with Pear Pizazz ink around the edges to give it some definition. I love the little Reese bunnies I found to go in them. He is just perfect except, like many of us, his hips are a little big. One of my hostess club members suggested we bite off his hips and wrap him back up! Good idea, Maybe not! Won 't these be cute in an Easter Basket. I 'll have another one tomorrow so don't miss it. Hope you are having a meaningful Holy week. 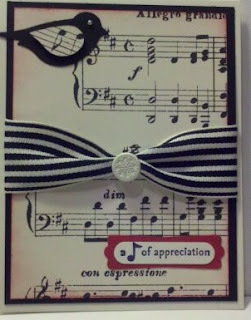 "God bless you real good"
I used the window word punch and Teeny Tiny Wishes stamp set for the sayings. My friend, Beve, is having a birthday Sunday! How cool is it to have your birthday on Easter! In honor of this, her birthday and Easter, I wanted to share something.... Chocolate!! 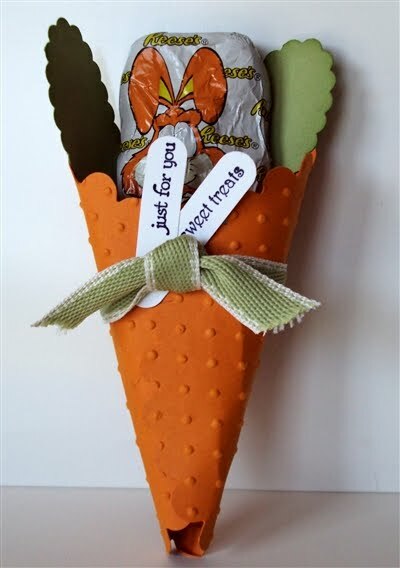 Isn't this the cutest little treat holder? I learned to make this folded cup in Girl scouts a million years ago. Well, maybe only 40 yrs ago, but it was a long time. This one is made out of our Springtime Vintage DSP, which is still available through the end of this month. 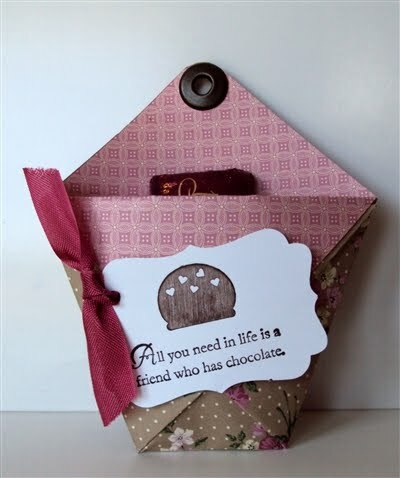 I love this Eat Chocolate stamp set which is also in the Occasions Mini cattie. This saying says it all! That's my kind of friend. I'd like to give Meg, one of my newest followers, a big southern Welcome to Stamping in Dixie. Meg visited me last week as part of my friend, Karen's, 2nd blog birthday celebration. She was sending folks all over the country for what else but BLOG CANDY! Meg just happened to win the gift set of note cards that I made for this event. Congratulations and I hope you like(love) them, Meg. The pictures I posted really didn't do them justice. Now for new business. This is a busy week. Thank the Lord, Tombo, finished our taxes at 11:47 last night! Yhew, just under the wire again. Our 29th anniversary is coming up next month and I think, maybe, we have mailed our taxes in before the last day-4 or 5 times. Maybe! We always promise to do better next year. (In his defense, he did do four or five returns before ours.) I have a birthday card to share with yall today. We made this card at my March workshop. A dear friend is having a birthday next weekend, is this your card? Maybe! The stamp set is from the saleabration promotion, which sadly is over and never to be seen again. The stamp set not saleabration! Anyway, I love the colors Elegant Eggplant and Always Artichoke. Very rich looking. 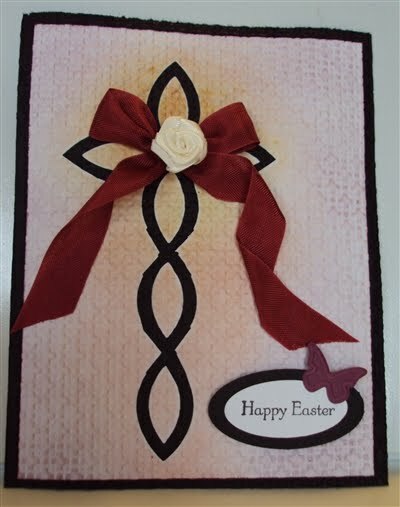 I also used the framed tulip embossing folder(love it), seam binding, and pearl embellishments. The stamping technique is masking. If you'd like to learn how to do this, leave me a comment and I'll give you instructions. It's really not difficult. Gotta run-come back tomorrow- Lots more to share. I love color! Most people who know me might laugh at this statement since 90% of my clothing is black, which is one of my favorite colors. I love red and blue and purple, I have even learned to love green which is amazing, after a bad childhood experience with a green and gold bedroom, I didn't think I'd ever like the color green. Now, Old Olive is one of my favs and I even painted my living room Olivine!!! 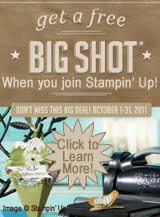 All this brings me to one of my favorite things about Stampin' Up! The fact I can purchase ink, paper, markers, crayons, chalks and other embellishments like ribbon and stuff all in the same color and coordinating colors makes designing cards and scrapbook pages a breeze. I also love how companies name colors- we have Real Red, Baja Breeze, Chocolate Chip, Early Espresso, Pretty in Pink, Pumpkin Pie to name a few...One of my favorites lately is Rich Razzleberry. It just makes a great transition from Winter to Spring. The cards I have to show today, I made for a friend of mine Karen. She has a blog My Points in Time. It is really fun to read, she is an budding author and has a different perspective on life in general. She is doing blog candy this week to celebrate the 2nd anniversary of her blog, so hop over there and take a look, leave a comment, sign up to follow her blog or mine or both and get extra entries. The purse is very simple and made out of one piece of cardstock. The cards are similar to a one sheet wonder were I just used pieces of DSP to embellish each card. I think yall will like this set. Have a great weekend and go bless someone today. Hello Stampers! It is hot here in Dixieland today! I mean HOT already!!!! I'm not ready for summer. Well, what do you think of this card and why did I call this post a Happy card? The base is made from basic black cardstock,the second layer is 4x5.25 DSP from the Newsprint pack(love this paper). I used the bird punch, 1.25 wide black striped grosgrain with a very vanilla brad. 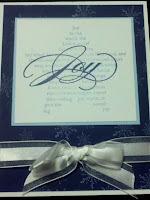 I used the modern label punch and window punch for the sentiment. However, the actually stamp is retired. The reason I called this a Happy card is that I made it for my step dad. We call him Happy! He is very involved with the community chorus in our small city and often needs thank you notes for various reasons. 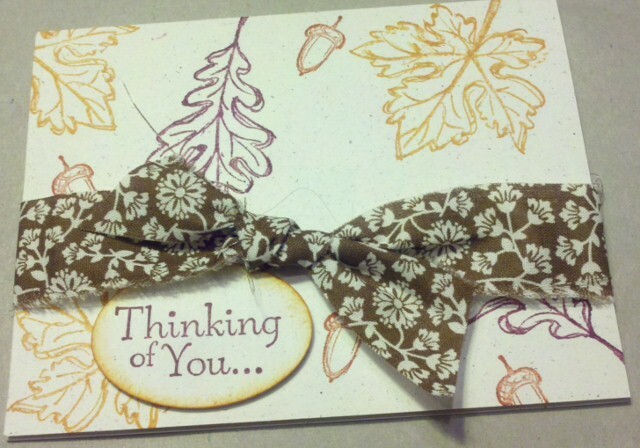 This card was perfect for him and one of the reasons I love stamping cards. You have the ability to make them perfect for the giver or the receiver or both! If you would like to learn to make cards for your friends and family shoot me an email and I'll be glad to help you get started. Well, I wish for you a happy day, tell someone you love them, tell someone you care! My friend Cindy's little boy turned 1 March 1st. 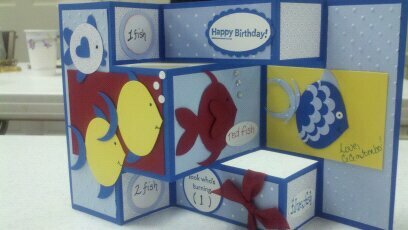 He had a great Dr. Suess birthday party, so I decided to make him a One fish, Two fish, Red fish, Blue fish card. I love it!!! It's a tri-fold card that will stand up when opened. Can you guess what punch I used for the fish? If you guessed the ornament punch, you are correct This was a fun card to make. Hope you like this as much as I do. Leave me a comment if you have time. Thanks for looking. Be blessed and go bless somebody else today. Hey Yall! How is everybody? I am okay! My friend Beve called this week and said, " Haven't seen your name in the obits, what's up?" another friend called tonight to see if I was still around, so I guess it is safe to say I've been out of the loop lately. Well, here is one of the reasons for the lost of contact with the outside world, I am the proud CeCe (Nana) of a precious little boy. Cooper was born February 11th. 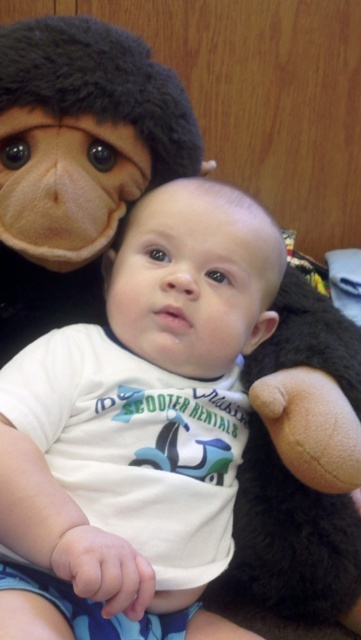 He went with his parents, big sister , Great grandmother, Cece and Chief to Orlando last month for several days and then, I started keeping him March 28th when Mommy had to go back to work. 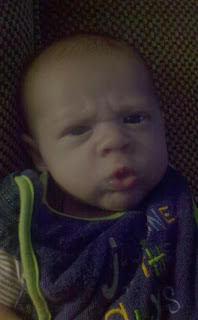 In this picture He is giving you his Daddy's Boy look! I did have a great trip to Orlando. Stampin' Up! hosted an all-day regional seminar for consultants and guest, Saturday, March 26th. It was great. Saw some amazing demonstrations from sister demonstrators, did make and takes, and of course shared swaps! I have a ton of ideas to share with yall, so please come back tomorrow and I'll have some cards and other ideas posted for yall. For now, blessings to all and to all a good night!